Six or eight groups of Morris Dancers from all over the northeast (Binghamton, Boston, NYC, and more) converge on NW Connecticut every June - each troupe performs all day at various venues, then they all converge in Falls Village (CT's smallest town, way smaller than Sharon, and a VERY cool artsy place!! I'd live there if I didn't already live here) for a big show and friendly competition, complete with passing the hat for beer money, just as Morris dancers have been doing since at least the 1400's. It was pouring rain, on and off, all evening, so they were all drenched, I'm sure, but it didn't quench their spirit! Lots more pics at my Picasa Web Album. Quintessentially English Morris Dancers in North America, this is surreal! 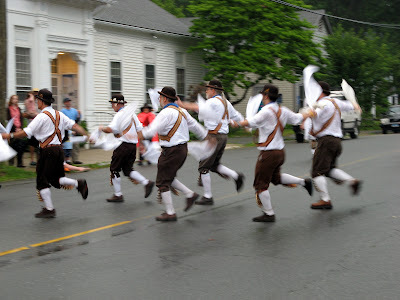 ...and in the tradition of Morris dancers, it shouldn't quench their thirst (for beer), either! Great photos! I loved all of them at Picasa, too. Looks like loads of fun. Must agree with Curly...so English! Loos like there had been some rain..glad it didn't spoil the fun. Will pop over and have a look at Picasa.